Crosby the crocodile is ‘not a happy chap’. He longs to find a friend on the river, but nobody wants to play with him. Uncle Gnarly Nose ‘smacks his big, strong tail’ at Crosby, and then a bird ‘flaps her sleek black wings’ as she flies away from the lonely croc. Even Crosby’s mum is too busy to swim with him. Little does Crosby know that his mum and dad have planned a big surprise for him – a new brother and sister with whom he can have fun. Now he ‘has the biggest smile … [and] is a happy crocodile’. 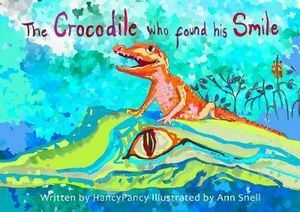 Created by the Australian pair HancyPancy and Ann Snell, The Crocodile Who Found His Smile is a delightful picture book for kids aged three to seven years. As HancyPancy’s rhyming text follows Crosby’s search for a playmate, it gently introduces young readers to real-life details about crocodiles (including what happens during territorial disputes). For older children keen to know more about saltwater crocodiles, HancyPancy has added extra information in verse form at the end of the book, such as they’re ‘three times faster than the fastest man’. Ann Snell’s vibrant illustrations bring the story to life. She channels the Impressionist artists of the nineteenth century, with her bold strokes of colour adding a unique dynamism to the scenes. Light dapples exquisitely across the river’s cerulean surface, and the subtle change in hues as day turns to evening is entrancing. Children who adore animals – especially reptiles – will fall in love with Crosby the ‘curious croc’ and enjoy the clever blend of fact and fiction throughout the narrative. And, if they look carefully at the lively images, they might spot an elusive little frog on each page!